Based on age, risk factors, size and location of aneurysm and your overall general health, your physician can discuss various treatment options, one of which is coil embolization. Coil Embolization is a minimally invasive procedure in which endovascular surgeon places a navigating small tube through a blood vessel in your groin and advance it up to the vessel of brain from which aneurysm is originating. Through this tube, the surgeon will place tiny soft metal coils within the cavity of aneurysm. These metal coils occupy the space and stay within the aneurysm thus prevent the blood flow from entering the aneurysm. (see figure): The rationale behind this approach is to seclude the aneurysm from general blood circulation which can reduce the risk of rupture and bleeding in to the brain. In order to keep the coils inside the aneurysm, your endovascular surgeon may elect to deploy additional devices in the parent vessel from which aneurysm is coming off. These devices include a balloon (Balloon-assisted coil embolization) or a metal stent (Stent-assisted coil embolization). Balloon-assisted coil embolization involves temporary placing of a removable balloon in order to do further packing of coils inside the cavity of aneurysm. (see figure): In cases of aneurysms with wide neck, stent-assisted coil embolization can be better option which involves permanent placement of a metal stent across the neck of aneurysm which can prevent the coils from coming back into the parent vessel and also provides high packing density inside the aneurysm. 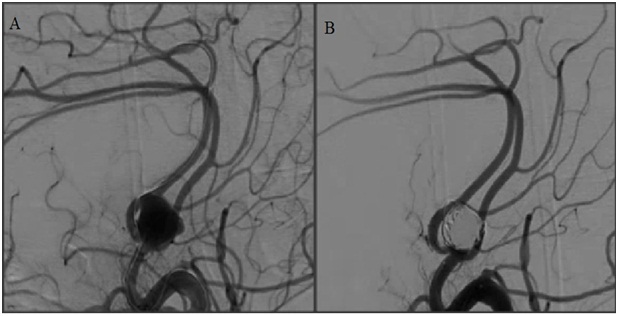 (see figure): In a study of treatment of wide neck aneurysms, stent assisted coil embolization provided higher rate of aneurysm occlusion and lower rate of re-treatment at follow up than balloon assisted coil embolization. In stent assisted coil embolization, you will be pre-treated with aspirin and clopidogrel which will be continued for 6 months after the procedure. Beyond 6 months of dual antiplatelet therapy, you will on aspirin indefinitely. Please see section of neurosurgical procedures for information on surgical clipping of brain aneurysm. Wermer MJ, van der Schaaf IC, Algra A, Rinkel GJ. Risk of rupture of unruptured intracranial aneurysms in relation to patient and aneurysm characteristics: an updated meta-analysis. Stroke. 2007 Apr;38(4):1404-10. Chalouhi, N., et al., Stent-assisted coiling versus balloon remodeling of wide-neck aneurysms: comparison of angiographic outcomes. AJNR Am J Neuroradiol, 2013. 34(10): p. 1987-92.